Bench with crossbar between two legs in the upper part. 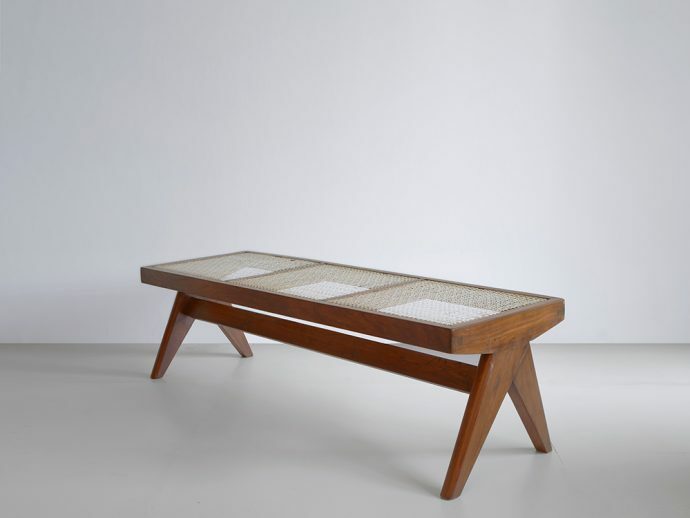 Bench Jeanneret with tubular braid seat. The Chandigarh exhibit is characterized by the clear shape. Teak and tubular netting or rattan are the materials. Authentic objects from the 1960s. Rare and beautiful. With this material world is the whole very beautiful. The bench Jeanneret is there for sitting. As a decorative element it is a piece of great beauty. Rare relics from India and the city of Punjab. Suitable for the living area and living room. The teak is brown and beautiful. Architects like Le Corbusier are looking for these furniture and also seating with cushions. If these things from rattan stand here, they please us. This collector's item is intended for collectors and museums. They stand around in the garden or in the house. These furniture fit to sofas and to antiques of the present time. The years around 1950 and because Nehru wanted the federal city was Le Corbusier. The designers and architects of a whole epoch are looking for this Unesco World Cultural Heritage. Tables and chairs fit well and the squatting becomes a recreation. These buildings are full of surprises and so the world is also good. These wooden furniture and wooden benches are high quality home furniture.